Albert L. Cohn, a prominent and prolific New Jersey litigator for almost 60 years who exemplified the old-fashioned generalist in an age of legal specialization, died on December 27. He was 83 and lived in West Orange, N.J., and Chilmark. Seemingly impervious to the passage of time, Mr. Cohn carried a full and varied caseload and served as managing partner of his law firm — Cohn Lifland Pearlman Herrmann & Knopf of Saddle Brook, N.J. — until November, when he was suddenly diagnosed with advanced metastatic melanoma. Less than two weeks earlier, he had attended his 60th Harvard Law School class reunion and was still rising daily at 6:14 am (in homage to June 14, 1959, the day he married his wife of 52 years, Sylvia) to swim 46 laps before going to the office. An adjunct professor at Rutgers School of Law-Newark for 26 years, Mr. Cohn chaired the board of the New Jersey Institute for Continuing Legal Education for 13 years and was honored by the New Jersey Bar Association with the Alfred C. Clapp Award for Excellence in continuing legal education in 1994. In covering the presentation, the newspaper New Jersey Lawyer noted that Mr. Cohn recently had won a custody case in Warren County, a probate case in Bergen County and a personal injury case in Bergen that netted his client a $3 million jury verdict. Judge Peter Doyne, chief judge of the Bergen County Superior Court, called Mr. Cohn a rare breed of lawyer who savored the battle of wits in a courtroom and excelled equally at product liability and malpractice law, divorce, custody, contested probate matters, employment harassment and corporate dissolution. Albert L. Cohn was born June 18, 1928. in Paterson, N.J. to a family of lawyers; his father, David, and his uncles all practiced law. After graduating from Georgetown University and Harvard Law School, he served in the Air Force and joined his father’s firm, which he later built into his own and relocated to suburban Saddle Brook. His articles on litigation have appeared in numerous publications, including Medical Malpractice Litigation and Strategy, the Rutgers Law Journal, the New Jersey State Bar Journal and the American Bar Journal. He co-authored the state’s standard reference book on professional negligence. He was a fellow of the American Bar Association Foundation and a trustee of the Bergen Bar Foundation. He was a founder of the Morris Pashman Inn of Court and was past president of the Harvard Law School Association of New Jersey. Mr. Cohn was prominent outside the law in civic affairs and the arts. 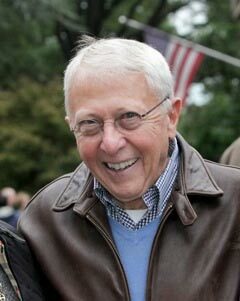 He was a president of Congregation Shomrei Emunah in Montclair, a trustee of the Jewish Theological Seminary, a member of the council of trustees of the New Jersey Performing Arts Center and a trustee of the New York Gilbert and Sullivan Players, proudly appearing as a walk-on in their productions of The Mikado, HMS Pinafore, and The Pirates of Penzance. A devoted family man, with five children and nine grandchildren, he was home every night in time for dinner, and then worked late into the night in his home study, according to his wife, Sylvia. Every summer, he and his family retreated to their second home in Chilmark, where he recharged and took great joy in sailing his catboat, the Kubu, out of Menemsha Harbor whenever there was a fair wind. In addition to his wife, Mr. Cohn is survived by a sister, Betty Ann Weintraub of Bozman, Md. ; by his children Melissa; Joshua (and wife Sharon Cohn); Priscilla (and husband Dan Karnovsky); Liza (and husband Bill Wallach); and Tad; and by his grandchildren Sarah Alvarez, Samantha Paprin, Rebecca, Abby and Zaky Cohn, Sydney and Nicholas Karnovsky, and Benjamin and Gus Wallach. Whether arguing before a judge or relaxing with family, he was known for his love of life, tenacity, and indefatigability. Funeral services were held at Robert Schoem’s Menorah Chapel in Paramus with burial in Cedar Park Cemetery on December 29. In lieu of flowers, the family asks that donations in his memory be made to www.melanomaresearchalliance.org.